Since its inception in the 1970s, hip hop music and the culture surrounding it has become a hugely influential and popular musical form in America and around the world. Its popularity extends beyond the urban centers where it was born, and pervades and influences youth culture around the globe. Although the media is full of images of hip hop stars, few artists have created serious and powerful photographs that explore the complexity of the phenomenon. 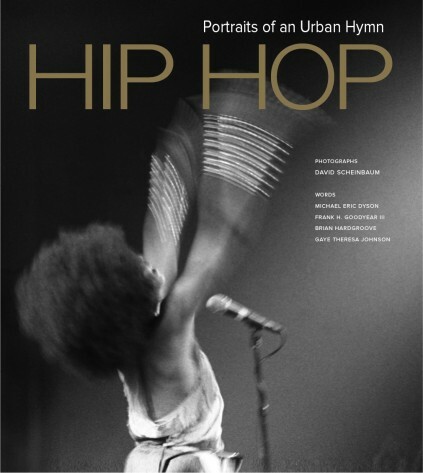 With David Scheinbaum’s images and incisive texts by scholars, cultural critics and public intellectuals Gaye Theresa Johnson and Michael Eric Dyson, as well as an artist conversation with Frank Goodyear Jr. of the National Portrait Gallery, plus an introduction by Public Enemy front-man, artist Chuck D., this book will look at Hip Hop as a positive cultural influence that is akin to the youth movements of the 1960s in its scope. David Scheinbaum is the Director of Photography/Artist in Residence at the Santa Fe University of Art and Design. With his wife, photographer Janet Russek, he operates Scheinbaum & Russek Ltd., private fine art photography dealers and consultants in Santa Fe, New Mexico, which exclusively represents the estate of Nancy and Beaumont Newhall, the preeminent photo historian with whom Scheinbaum worked from 1978 until Newhall’s death in 1993. Scheinbaum has exhibited internationally, and is represented in many museum collections. His previous books include Bisti (University of New Mexico Press 1985); Miami Beach: Photographs of an American Dream (Florida International University Press, 1990); Ghost Ranch: Land of Light (with Janet Russek) (Balcony Press, 1997); Images in the Heavens, Patterns on the Earth: The I Ching (with Janet Russek) (Museum of New Mexico Press, 2005); Stone: A Substantial Witness (Museum of New Mexico Press, 2006); Nancy Newhall: A Literacy of Images (Museum of Photographic Arts, San Diego, 2008); Beaumont’s Kitchen: Lessons in Food, Life and Photography (Radius Books, 2009). Michael Eric Dyson is a writer, scholar and ordained Baptist minister. Hailed by Ebony as one of the hundred most influential Black Americans, he is the author of sixteen books, including Mercy, Mercy, Me: The Art Love & Demons of Marvin Gaye; Open Mike: Why I Love Black Women; Holler If You Hear Me: Is Bill Cosby Right? ; Searching for Tupac Shakur; I May Not Get There With You: The True Martin Luther King, Jr.; Making Malcolm: The Myth and Meaning of Malcolm X; and Between God and Gangsta Rap. Gaye Theresa Johnson, Ph.D. is a mother, a partner, an activist, and an academic. She is Associate Professor of Black Studies with affiliations in the Departments of History and Chicana/o Studies at the University of California at Santa Barbara. Her areas of expertise are twentieth century U.S. history; race and racism; and cultural history with an emphasis on music. She is active with the Los Angeles Community Action Network’s (LACAN) struggle for housing and civil rights on LA’s skid row. Her new book, Spaces of Conflict, Sounds of Solidarity: Music, Race, and Spatial Entitlement in Los Angeles, is a history of civil rights and spatial struggles among Black and Brown freedom seekers and cultural workers in LA. She is also working on a radical history of women in hip hop, under contract with Haymarket Press. Frank H. Goodyear, Jr. is a curator of photographs at the Smithsonian’s National Portrait Gallery and an affiliated faculty member in the Department of American Studies at The George Washington University. He has written extensively about the history of photography. His books include Red Cloud: Photographs of a Lakota Chief (2003), Zaida Ben-Yusuf: New York Portrait Photographer (2008), and Faces of the Frontier: Photographic Portraits from the American West, 1845-1924 (2009).